Strange, my only engine earth strap is on the lower drivers side engine steady, from the gearbox. i have added an 8GA wire from the gearbox to the ground point near the starter solenoid. Ill get a new braided strap and add it to the engine steady as above. I think i found the throttle issue. Its not the cable or the carb, both work fine, it appears to be some corrosion on the pedal assembly. Have tweaked it and will refit tomorrow and test. The earth strap from the engine steady to the bulkhead was moved there for the injection cars. I don't know why. Earthing through the subframe on the later rubber mounted subframe cars like mine seems... problematic. Adding the new ground hasnt made any difference, but hey, peace of mind and all that. Before I get to the tacho, first I have to mention my throttle issues. The last few times I have driven the Mini I have noticed the throttle sticking when pressing down on the pedal. It sticks so you need to apply more pressure to push it passed that point. The point is completely variable, it can happen at the bottom of the pedal or half way up. Thankfully it doesn't stick the throttle open, it just makes accelerating a bit jerky. I had heard that if the engine ground isn't good that the car can end up using the throttle cable as the main ground, and because the throttle cable is very thin it heats up a lot and melts the inside of the throttle cable liner. I had suffered a very similar issue with Effie a while back when the ground point was corroded, and the throttle cable did indeed start to smoke and get damn hot, but the cable survived that. My Mini only has one engine ground strap, which goes from the gearbox to the subframe. Only issues there is that the front subframe in the MK4 Mini is mounted to the car via rubber insulated mounts. This is meant to make the car less harsh than the older ones, with less vibration, but I doubt anyone would ever consider a Mini soft anyway. As most of you will well know, rubber is a terrible conductor of current, so relying on that to ground the engine isn't really good. I had some bits sitting around, so I whipped up a quick additional ground from the gearbox to the grounding point on the body. I was going to use some wire I had from a cheap subwoofer kit I had, but when I looked at the 8GA wire it came with I found that the whole wire, insulation and all, was thin enough to fit in the terminal. The actual copper in the insulation was about half of what my decent 8GA wire was. The proper 8GA wire, the copper its self is as thick as the whole insulated Chinese wire. It doesn't appear to have actually done anything, but I see no harm in it being there. The later injected Minis have another ground strap that goes along the top engine stabiliser to the body, likely as the injection system requires far better grounds. To see if the average grounds had damaged the throttle cable I disconnected and removed it from the car. Thankfully the cable slides freely in its sleeve, even when looped or gently bent. So the cable wasn't the fault. I also checked the carb, this operates freely and smoothly, so that wasn't the fault either. The next option was the throttle pedal assembly. I removed it from the car and had a look. This photo is from after I had lubed the pivot point up, but you'll get the idea. I found a lot of corrosion on the pivot point, where the pedal arm pivots on the firewall mount. It turned out the washer (green arrow) was corroded to the mount (orange arrow) and stuck to it. This meant that when the arm pivoted, the washer was binding on the little tab (red arrow) that stops the whole lot sliding over. A quick dose of percussive persuasion quickly freed the washer up, but it had caused some damage to the arm, and the mount due to corrosion and wear. I thoroughly lubricated everything with WD40, and then smothered it in copper grease to help keep further corrosion away, and keep it free. Whilst I was sorting the throttle, the courier arrived and left me a nice little package from China. It was my tacho. These old Minis don't have one standard, and just for my own interests I wanted to add one, but make it completely reversible (so no drilling holes etc). Installation was a piece of cake. I took power from the top fuse, which had a free spade terminal. This is switched power, and I used it for both main power and backlight, so the backlight is on whenever the ignition is on. The only other wire was the signal from the negative on the coil. I was hoping to just pop it on a spare spade terminal like the positive has, but either it didn't come with one or someone had broken the extra spade terminal off the negative, so I used a much hated splice connector. These are kinda cool because you use a spade terminal to join the second wire into the connector, so it can be disconnected easily. 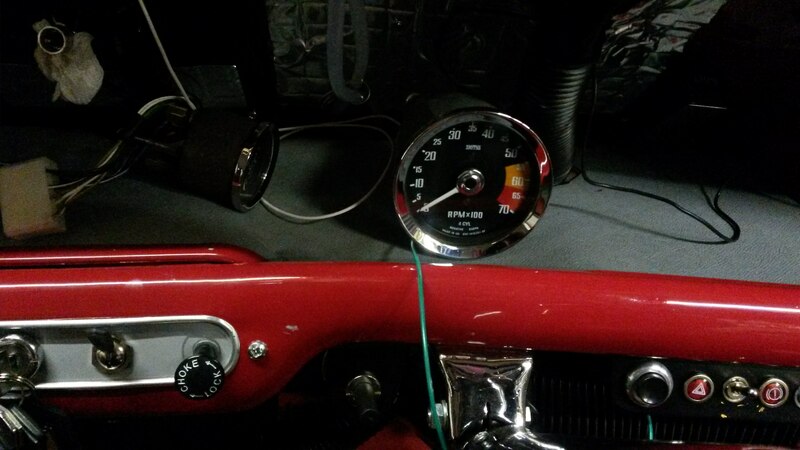 I wasn't sure where to mount the gauge, but knew I wanted it kinda in front of me, but not in the way of anything. I didn't want to drill holes anywhere, so it had to be mounted on something solid so I could use trim tape to stick it on. The top dash rail worked, although my tape didn't stick very well to it, so it may have to move again. It also gets a bit of glare from the side window. Now, before you ask, yes, I did mount the gauge on the piss on purpose. I don't care much for the lower RPM range, so I arranged it so that at the 12 o'clock position the needle will be at about where I should let off the throttle. The little A Series engine is apparently only good for 6000RPM or so, so if I see the needle at the top, its time to back off. Because race car. I'm not sold on this gauge, it seems a bit lazy to respond and looks cheap. It was cheap, so let's be honest I didn't expect miracles, but the plan down the line is to make a custom dash and integrate a couple of extra gauges (like tacho), but I wouldn't be reusing this gauge in that. It'll do for now. Really enjoying reading all this! What sized wheel cylinders did you use on the front? Erm... standard replacement? I still have the box so will check tomorrow and see what it says. Edited by johnR, 08 July 2018 - 12:46 PM. Hadnt seen that before.... tempting. Mini is having a break, since it chose to be a pain. Sounds like its broken the exhaust sealant at the downpipe join again, so ill need to take the carb off and fix that again. Probably has something to do with all the exhaust mount bolts being loose. The previous owner REALLY didnt like to tighten anything. Delaying the re-rego check for a bit, until i sort a couple of other things too. Not sure if you know or not, you are able to reregister the car and reuse the original plate. Steve from Classic mini spares in Te puke told me. Beats changing to a new one. Yeah, got that teed up already, so ill be keeping the black plates. Wouldve been pretty disappointed if i had to change to white ones.